BRAZIL, Ind., Oct. 21. –Reuben Jacob Schiele, aged 75, a prominent farmer of near Clay City for many years, died last evening at the home of his daughter, Mrs. B. O. King, at Terre Haute, of obstruction of the bowels. The deceased was born in Ohio, but had spent most of his life in Clay county. 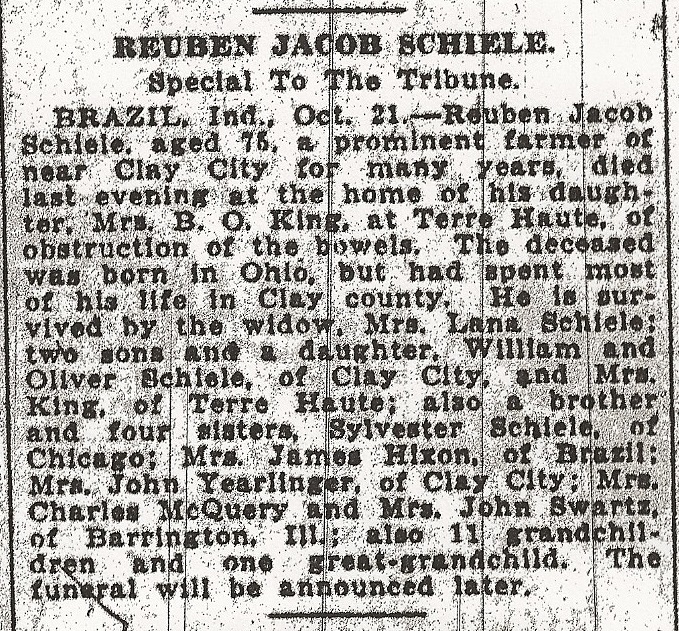 He is survived by the widow, Mrs. Lana Schiele: two sons and a daughter, William and Oliver Schiele, of Clay City, and Mrs. King, of Terre Haute; also a brother, and four sisters, Sylvester Schiele, of Chicago; Mrs. James Hixon, of Brazil; Mrs. John Yearlinger, of Clay City; Mrs. Charles McQuery and Mrs. John Swartz, of Barrington, Ill.; also 11 grandchildren and one great-grandchild. The funeral will be announced later. “Reuben Jacob Schiele,” Terre Haute Tribune (Terre Haute, Indiana), 21 October 1931, p. 2. Reuben Schiele was born 27 June 1857, Medina County, Ohio. He was the eldest son of Michael Schiele and his first wife, Mary Magdalena Miller. He moved with his parents to Clay County as a young boy. On 8 June 1880, Reuben married Lanah Markley. They were the parents of four children: Ida E., Edith M., Oliver L. and William J. Reuben was a farmer like his father. William Travis, A History of Clay County Indiana (Chicago: The Lewis Publishing Company, 1909), 401-402. Reuben is buried with his wife Lanah at the Maple Grove Cemetery, Clay City, Indiana. 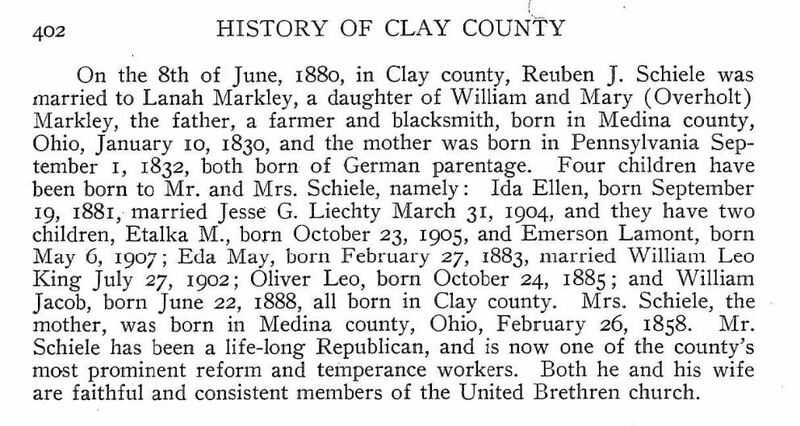 This entry was posted in Genealogy, Schiele, Sunday's Obituary and tagged Clay City, Dora (Schiele) McQueary, Edith (Schiele) King, genealogy, Ida Ellen (Schiele) Liechty, Lanah (Markley) Schiele, Lovina (Schiele) Yegerlehner, Mary (Schiele) Hixon, Mary Magdalena (Miller) Schiele, Michael Schiele, Oliver Leo Schiele, Reuben J. Schiele, Silvester Schiele, Sunday's Obituary, Susan (Schiele) Schwartz, William Jacob Schiele on December 8, 2013 by Deborah Sweeney. Thank you for sharing this. 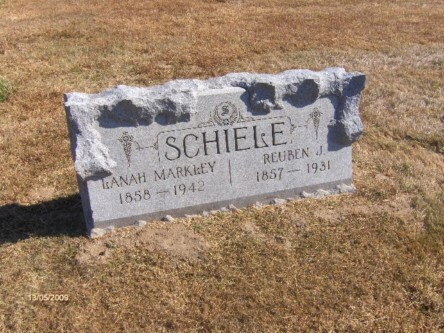 Reuben Jacob Schiele is my second great grandfather. I am now anxious to see some of your other postings. I actually just finished a paper on Michael Schiele. I need to adapt it in the next few months, and I am hoping to get it submitted to a genealogy magazine. Michael was Reuben’s father. Do you have any photographs of Reuben or any other family members? Yes, I have a couple of photos of Reuben and his wife, Lanah. They are in pretty bad shape and have been “colorized” by someone in the past. I also have his daughter, Edith Schiele’s Bible which contained some family information and some obituaries. I just posted a new picture on the blog for you. The post is titled – Wordless Wednesday – Schiele Brothers. Awesome! Thank you. I can’t wait to read your story of Michael Schiele, the shoemaker turned farmer! Oh – and I also saw a photo on your Clay County Photos of the Clay City Normal School c1890 that I believe includes my great-grandmother, Edith Schiele. She is in the back row, third from the left. If that is her, then the date on the photo would be around 1896. Thank you so much! I have a handful of additional documents to procure, then I want to submit the article for publication. Hopefully by this summer! Mrs. John Yearlinger Did the newspaper get the spelling “wrong”–or was that one of the mutations of the name? Your guess is as good as mine! Actually, the family always seems to have known how to spell the name. I fear this was a mis-spelling by the paper’s editor.